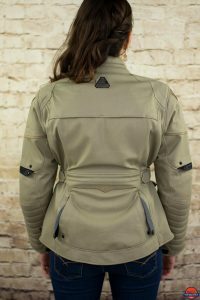 The Cadence is an affordable textile jacket that offers excellent three-season ridability thanks, in part, to its Thermo-Guard liner. With ample storage and a comfortable fit, riders will enjoy the Cadence's well-placed vents and deep pockets. CE level 1 armor is included for the shoulders and elbows. The Cadence would benefit from additional high-visibility sections, as save for the logo at the base of the neck, the Cadence has none. Affordable, comfortable to wear, and made well- the Cadence ticks most of the right boxes. With the Albertan riding season now coming to a close, it’s time for the review of this Cadence to go live. We’ve had the Cadence in our possession since May but decided to wait until cooler weather before publishing this review. That time came and, I have to say, I’m impressed with how the Cadence has handled lower temperatures. 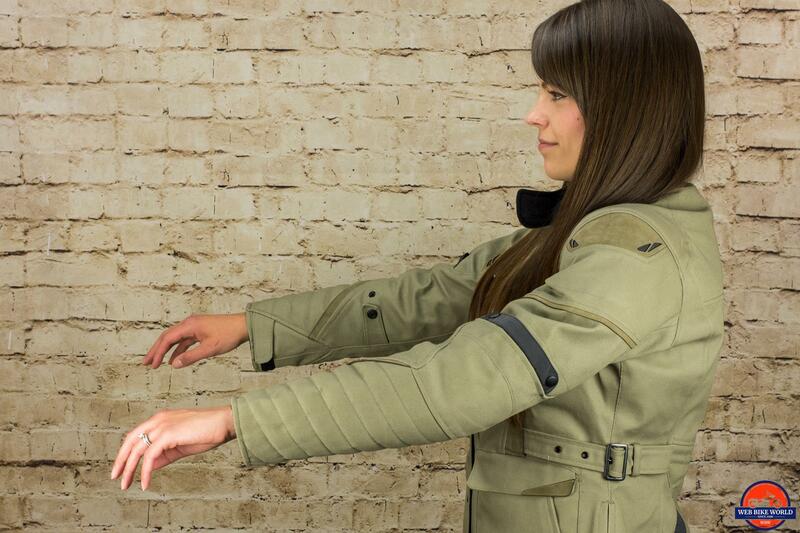 The Cadence is a sub-$300 textile ladies jacket, with touring style and comfort. 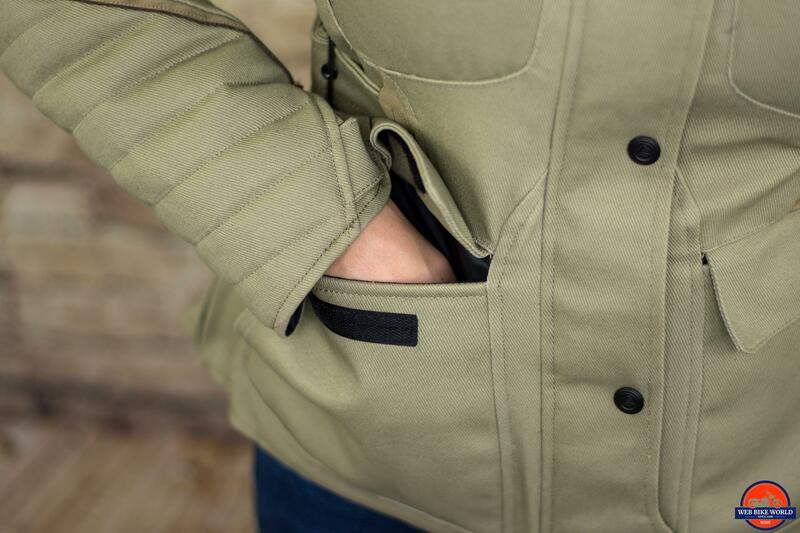 The jacket features plenty of ventilation, considerable storage, and a removable Thermo-Guard liner that helps it weather the cool… weather… in stride. My wife Melissa – shown here – provided her thoughts while I penned this review. The Cadence is available from a number of online outlets as well as from Fieldsheer directly. The Cadence comes in an always-exciting Khaki Green, with tan, grey, and black accents. I wouldn’t say that the Cadence is particularly exciting in terms of style, but I would say that it’s almost nondescript enough to pass as something other than a motorcycle jacket. Almost. 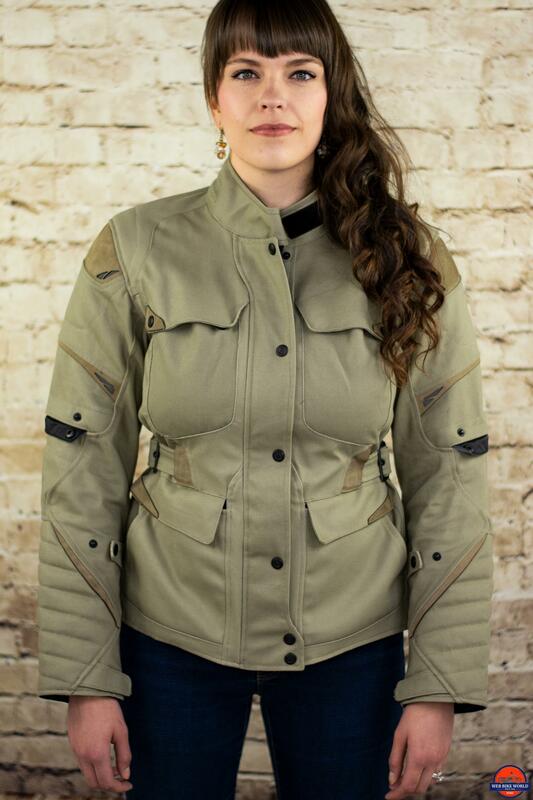 The front of the jacket showcases four large pockets – one at each breast, and two at the waist – and a raised collar that snaps shut, providing a decent amount of neck protection against wind and small road debris. Most of the jacket is the same flat khaki color and texture; the exception is the forearms, which are ridged and feel as though they are filled with foam. 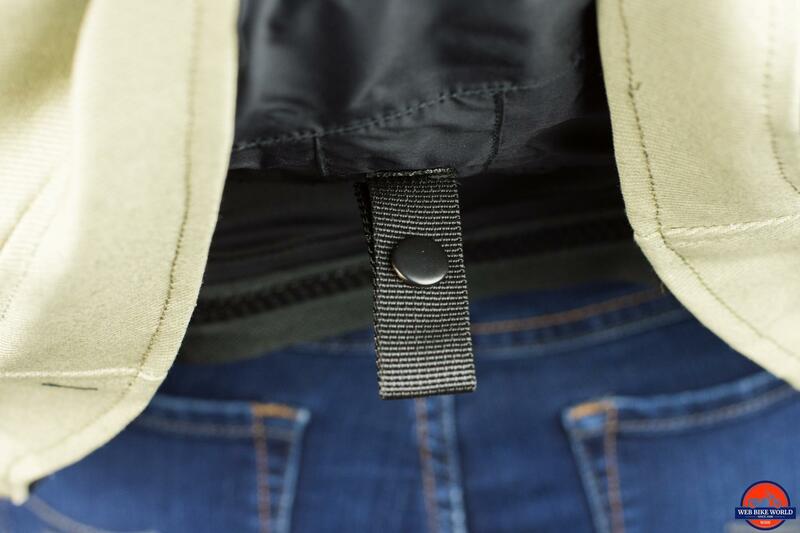 A strap and buckle sits midway up either side of the jacket- with them, you can adjust the Cadence quite significantly, adjusting the fit by several inches (each side has 3 notches in the strap) if you want. Each arm is accented by tan inserts and two snap-straps: one to adjust forearm width, and the other for adjusting the sleeve opening width. Just above the elbow is an arm vent, which opens and closes in a snap (pun intended). I would have really liked to have seen some high-viz accents on the arms or shoulders, as the good heat-management properties and touring styling of the jacket make it likely that riders will wear it once the sun sets. A little bit of safety goes a long way, and the lone high-viz accent – the Fieldsheer logo stitched at the base of the neck at the rear of the jacket – doesn’t do a great job in keeping you nighttime visible. 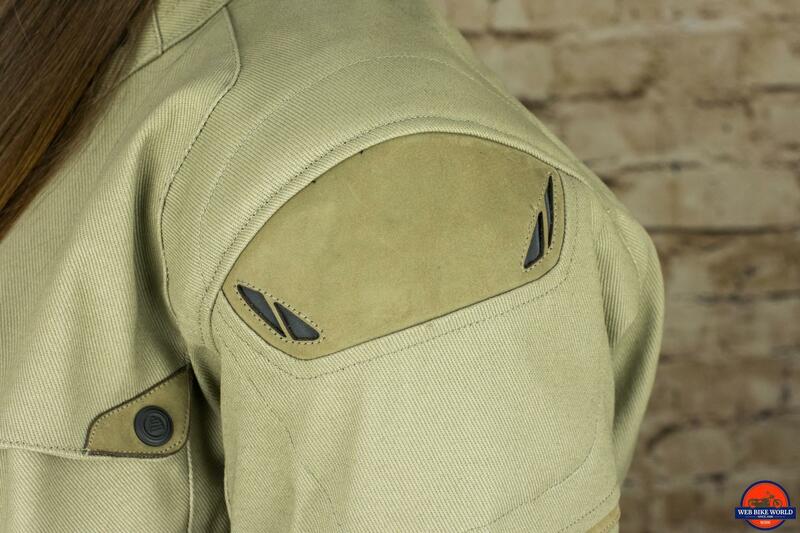 The rear of the jacket is also quite spartan, with the Fieldsheer logo and the two vents on either side of the waist serving to break up the glorious khaki green. Branding on the Cadence is kept to a minimum. 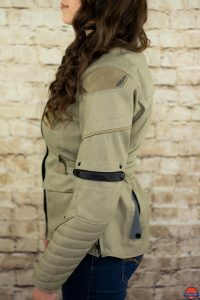 Overall, the Cadence is a fine looking, if somewhat muted, touring jacket that most riders will find fits their styling sensibilities. The Cadence is decidedly average in terms of protection, coming equipped with CE level 1 armor in the elbows and shoulders. A foam back pad is also included, though I wouldn’t count on it to provide much more than a token amount of protection in the event of a crash or fall. CE level 1 is a decent level of protection, but CE level 2 would’ve upped impact resistance by a fair degree and bolstered the Cadence’s safety credentials. Of course, considering the jacket is priced under $275, the use of CE level 1 makes sense. You can replace most of the level 1 armor with level 2 if you feel so inclined. The back pad and shoulder armor can be removed easily enough, but the elbow armor is a bit trickier due to its location. 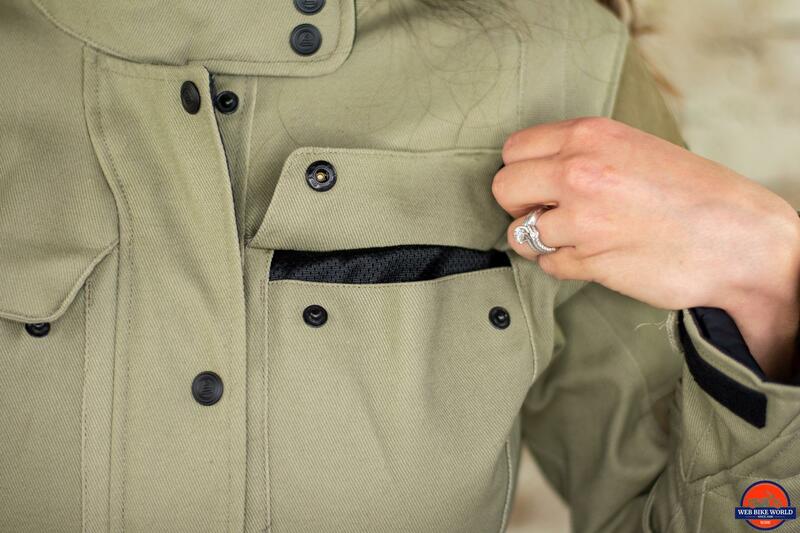 You can’t pull the sleeve through the jacket easily to turn it inside out (because of the armor), so you have to access it via the openings at the wrist. It isn’t laborious to remove the armor, just a bit tricky due to limited accessibility and visibility. According to Melissa, the Cadence is comfortable and flows a decent amount of air through it when you’re at speed. Vents on the arms, sides, and rear of the jacket help keep you cool and all can be opened/closed via snaps. The Thermo-Guard liner is quite good at keeping you warm, reducing interior airflow to a minimum. Melissa removed it for most of the summer, only putting it back in the Cadence in September. Ergonomics are good, as is mobility. Assuming a proper fit, you shouldn’t have any problems with mobility/flexibility. The jacket does have a slight pre-formed riding position fit, but it isn’t nearly as aggressive as the fit on the Suzuka racing jacket is- it’s just enough to keep it from crimping too much when you’re behind the bars. There are three vented areas on the Cadence: just above the elbow on each arm, the upper back, and lower back (near the waist). The arm and waist vents open/close via snaps, while the back vent is always “open”. Since the back vent is tucked underneath overlapping material, it generally isn’t a concern regarding water penetration. A ventilated textile jacket is not waterproof, and the Cadence is no exception. Water resistance is good overall, but if you want something waterproof, you’ll want to consider other jackets. The Cadence will be sufficient for most riding situations, but you’ll get wet if you find yourself caught in the rain. Closing the vents does a decent job keeping you dry, but remember these are snaps vs. zippers and don’t completely seal. Don’t go play with a hose or decide that riding in a downpour is the way to go and you’ll make it out just fine. 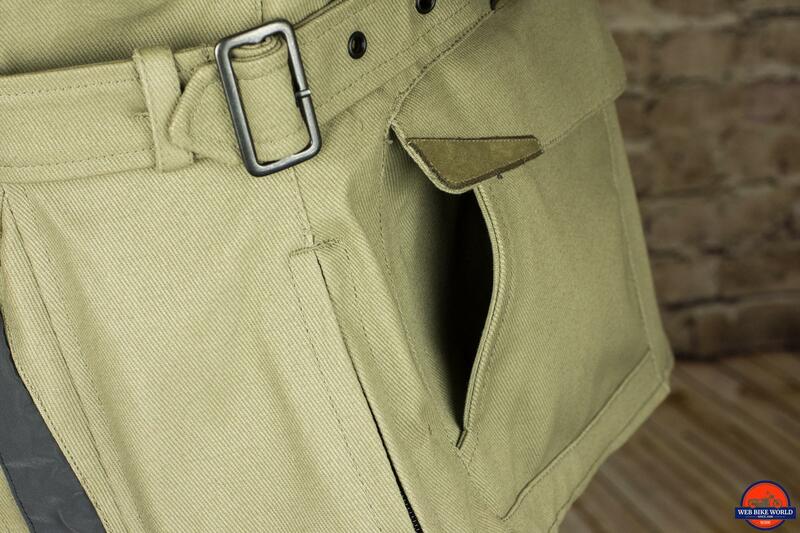 You can connect the Cadence to your belt or riding pants via the rear loop. The loop is only single-stitched, though, which is surprising given the force that would be placed on this area in a fall or slide. 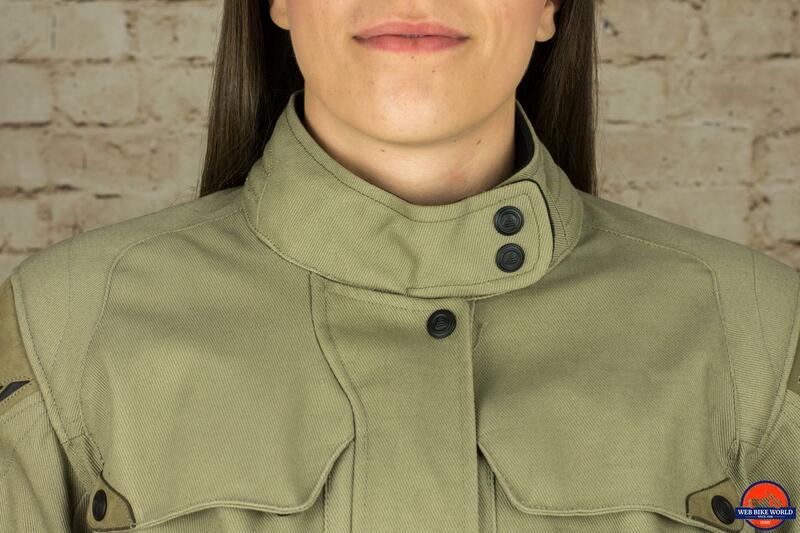 The collar is lined with fleece, helping keep it comfortable for periods of long riding. The fleece is soft and doesn’t irritate the skin. 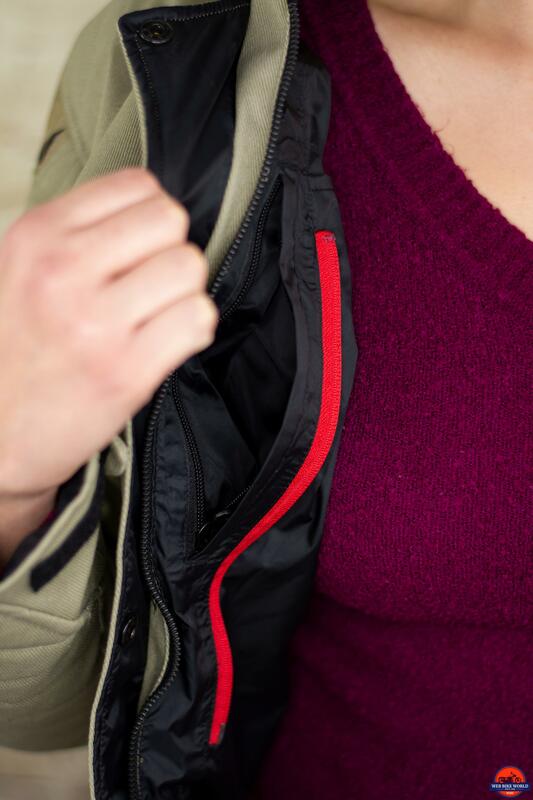 You can zip/unzip sections on either side of the jacket near your hips, allowing the Cadence to adjust as needed for a more comfortable fit. This is in addition to the waist belt/buckles. With the interior liner removed, the Cadence weighs approximately 3.5lbs- heavy enough to feel reassuring but light enough to remain comfortable on long rides. 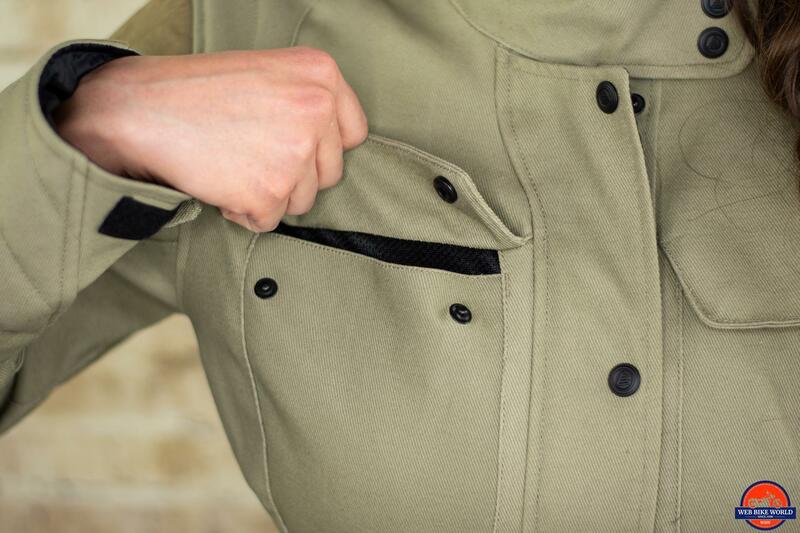 Good news: the Cadence has pockets everywhere! 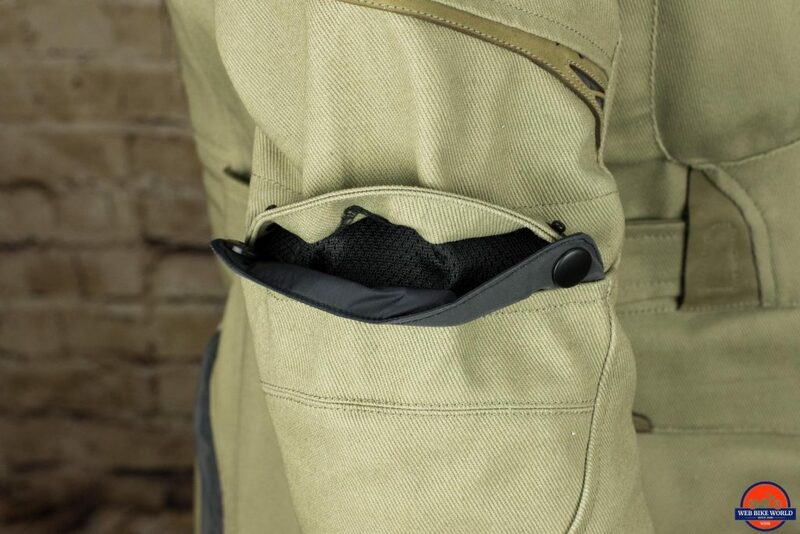 Six on the front (four sealable pockets and two hand pockets), an interior zip-up pocket on the right breast, and a Velcro-sealed pocket on the interior left. They are all a decent size and each can hold keys, a wallet, and a phone. Most connecting sections, as well as high-impact areas, are double-stiched. 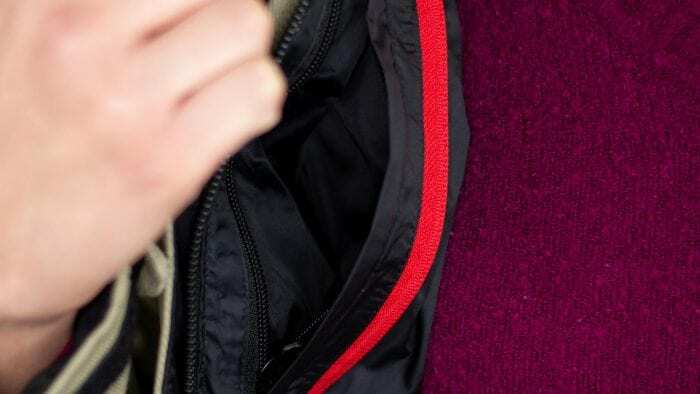 The stitching is also very cleanly done, which not only helps contribute to the feeling of polish and quality on the Cadence, but also plays a part in the overall clean-cut presentation of the jacket. The Cadence looks as good as it feels, and it’s reassuring to see that it’s made as well as it looks it like it ought to be. The outer shell is made of Carbolex-HD, a water-resistant synthetic fabric that is made from polyester fibers. Fieldsheer claims that Carbolex-HD has been tested using ASTM standards and found to be four times stronger than other nylon fabrics and twice as strong as standard Carbolex. Fortunately, neither Melissa nor myself have had an opportunity to test this hands-on, so we’re going to take Fieldsheer’s word for it on this one. 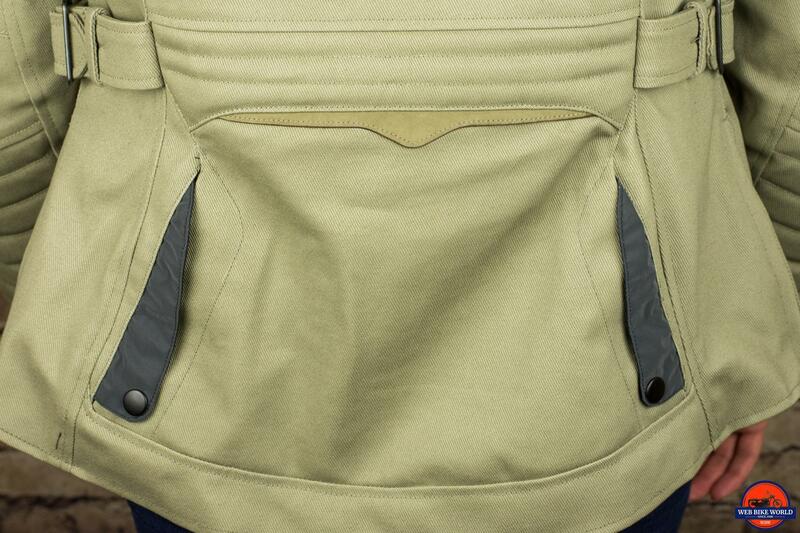 After four solid months of use, we have found a few stray stitches, mostly around the external left breast pocket. The rest of the jacket looks relatively new despite the miles it’s seen. I have no reason to believe the jacket wouldn’t survive for the next few years of regular wear and riding. The Cadence is a good jacket that’s priced right. 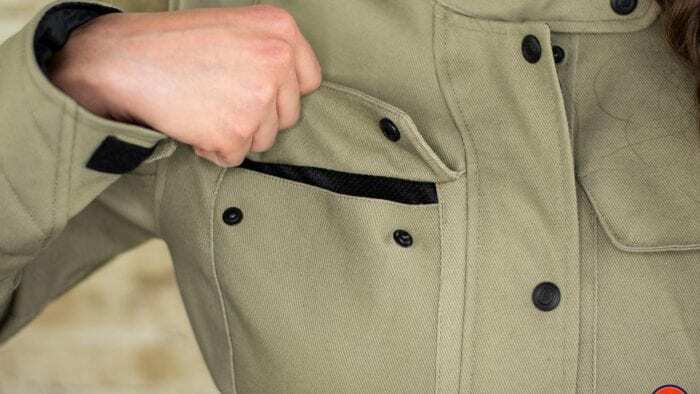 We like the ample storage available, and we like that all of these pockets – aside from two of the front pockets – can be snapped or zipped closed. In most respects, the Cadence plays in the playground it’s competing in. Comparably priced jackets from brands like Icon, REV’IT, Tourmaster, and the like offer similar features/functionality. 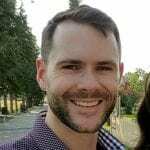 The main difference is that some jackets that are closer to the $300 mark include CE level 2 armor in the shoulders and elbows, whereas you’ll have to pony up some extra cash to have level 2 integrated into the Cadence. As of the time of this writing, Fieldsheer sells Armadillo CE level 2 shoulder armor of $15 and a level 2 back pad for $25. No level 2 elbow armor is offered for sale on Fieldsheer’s website. Assuming you’re not into racing, most riders will find the Cadence properly equipped as is. Aside from lacking high-visibility sections, there’s not much to fault in the Cadence. Disclosure: Fieldsheer provided the Cadence at no-charge to webBikeWorld for the purposes of this review. Comfortable fit that is adjustable at the waist, hips, and forearms. Interior Thermo-Guard liner does its job. Arm and back vents flow air nicely through them.